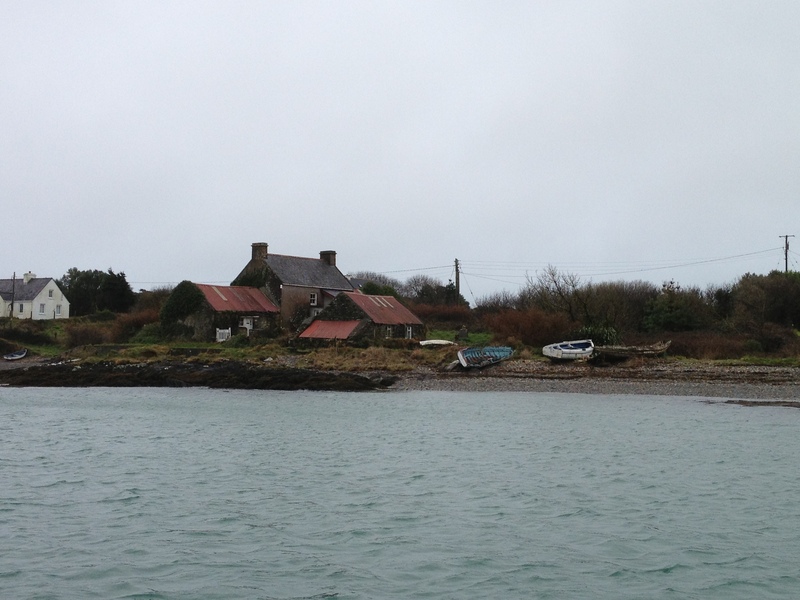 I have been hearing a lot about Firehouse Bread, the bread school run by Patrick Ryan, in the last few months, and have been following their tweets filled with pictures of delicious breads, and pictures of Heir Island where they are set up. 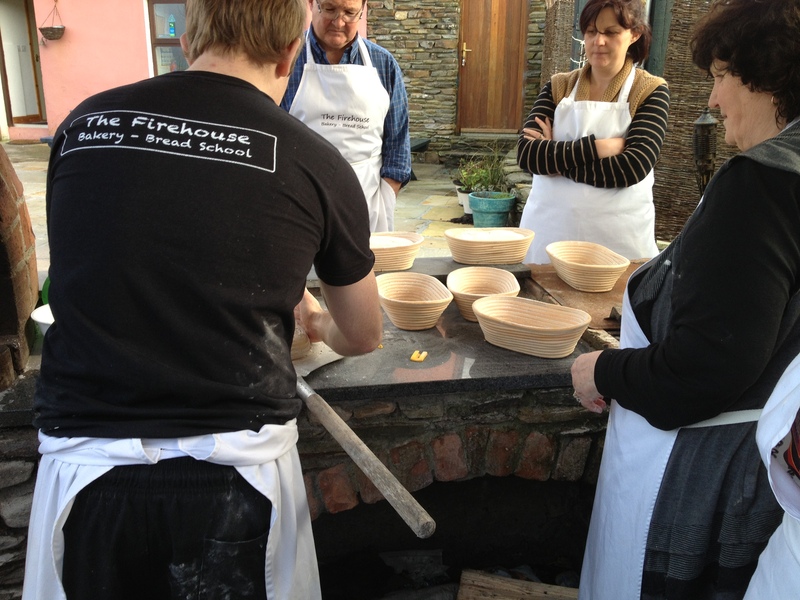 It seemed really cool, different and good craic so for Christmas I got my boyfriend and I a voucher to do the course, and last weekend we trotted down to West Cork for the ultimate bread making experience. The day started on Cunnamore Pier where we got the boat across to Heir Island and were greeted by Laura who runs Firehouse with Patrick, she drove us to Firehouse, a stunning house overlooking Roaringwater Bay. 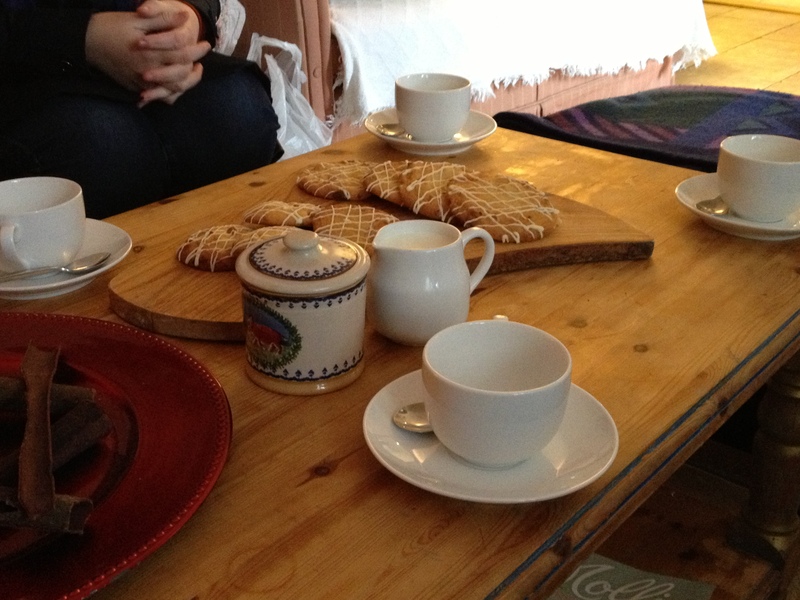 Here she brought us into their front room for tea, coffee, and some freshly baked biscuits before we got started. There were 6 of us on the course and we all quickly got chatting. 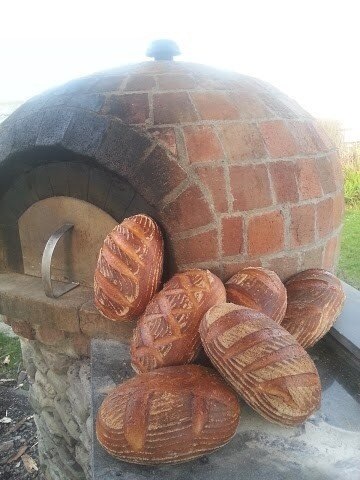 Sourdough is time consuming as it takes time to prove, the knock back, then prove again. However it tastes delicious, makes the best sandwiches and toast in the world, and freezes quite well. I’m sure if you get into the habit of making it though, it becomes routine. It’s also worth it for the smug “Oh I made this myself” boasts as you eat your lunchtime sandwich. It’s a great one to make on a Sunday to keep you going through the week. In fact Laura said that when the sourdough is 3 days old it’s perfect sliced, grilled and lightly oiled for bruschetta bread. 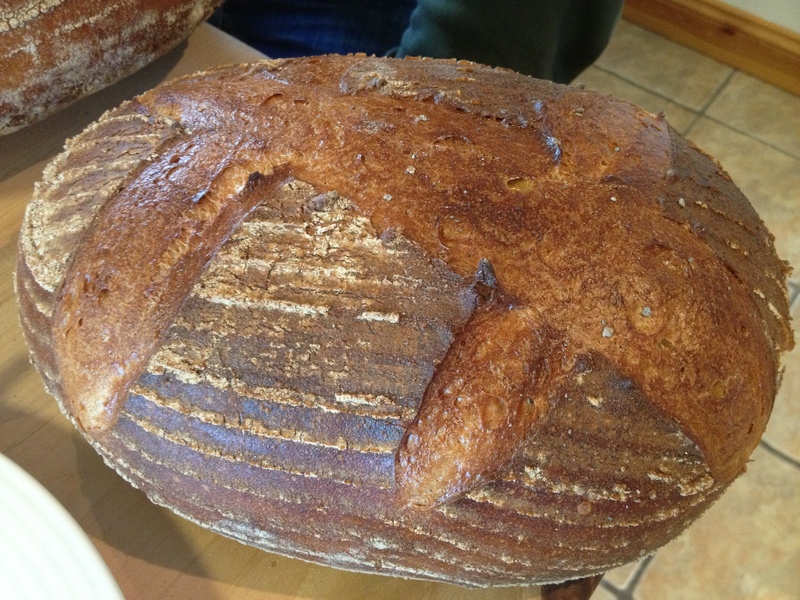 Check out Patrick’s recipe below for the perfect sourdough bread! Day 1: Heat 175ml milk gently. Place 75ml natual yoghurt in a bowl and stir in the milk. Cover and leave in a warm place for 12 to 24 hours until thickened. Stir in any liquids that may have seperated. Day 2: Stir 120g white flour into the yoghurt, incorporating evenly. Cover and leave in a warm place for 2 days. The mixture should be full of bubbles and smell pleasantly sour. Day 5: Add 175g flour to the starter, and mix in 40ml milk and 100ml water. Cover and leave in a warm place for 12 to 24 hours. Day 6: The starter should be quiet active now and be full of little bubbles. Now you can get cracking and see how many years you can keep your starter going for, some families have the same starter for generations! 1. Mix together the flour, starter and water in a bowl. Add the salt and sugar. Turn out on to a clean kitchen surface and knead for 10 minutes or until the windowpane effect is achieved. (This basically means when you hold up a piece of the dough it supports it’s own weight and rather than tearing and falling away, it holds it self up creating a translucent effect rather than tearing). 2. 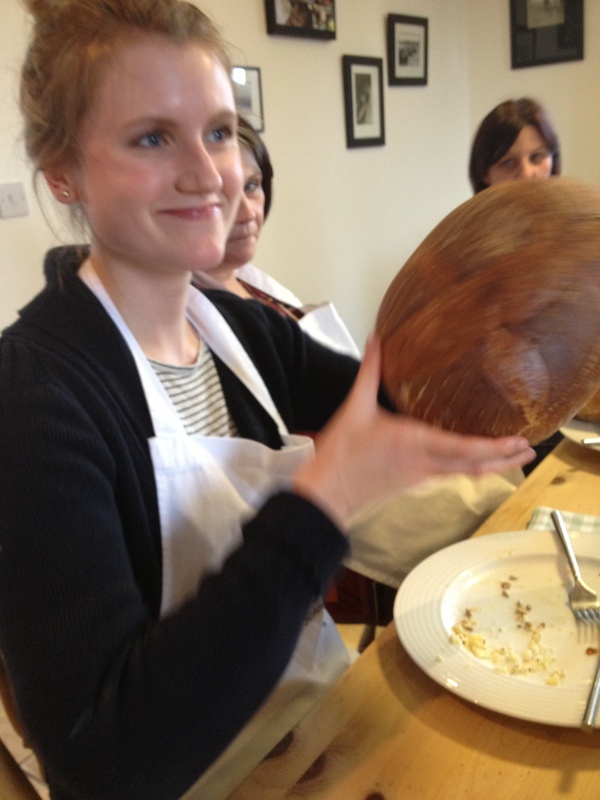 Put into a lightly oiled bowl, cover with a damp tea towel and let it prove for 2 1/2 to 3 hours. 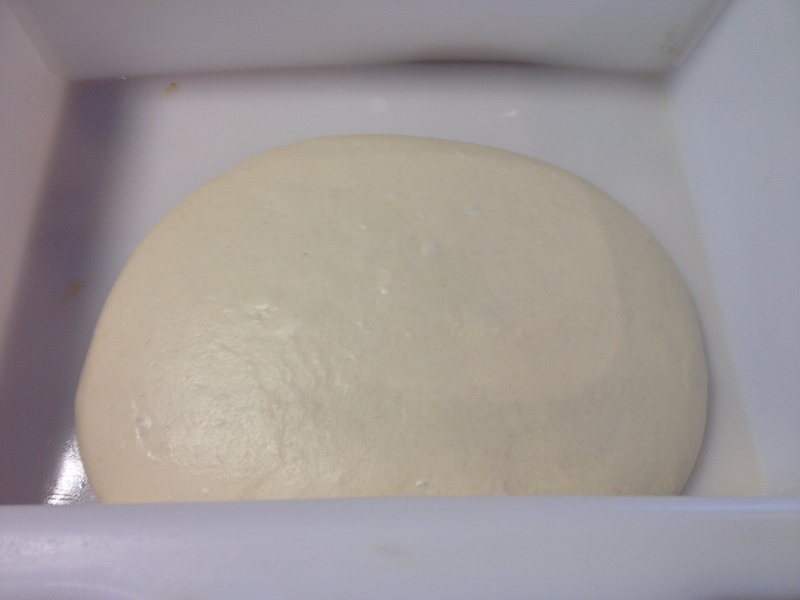 You won’t notice as much as a rise in the dough as you would with a normal yeast bread, it takes much longer. 3. 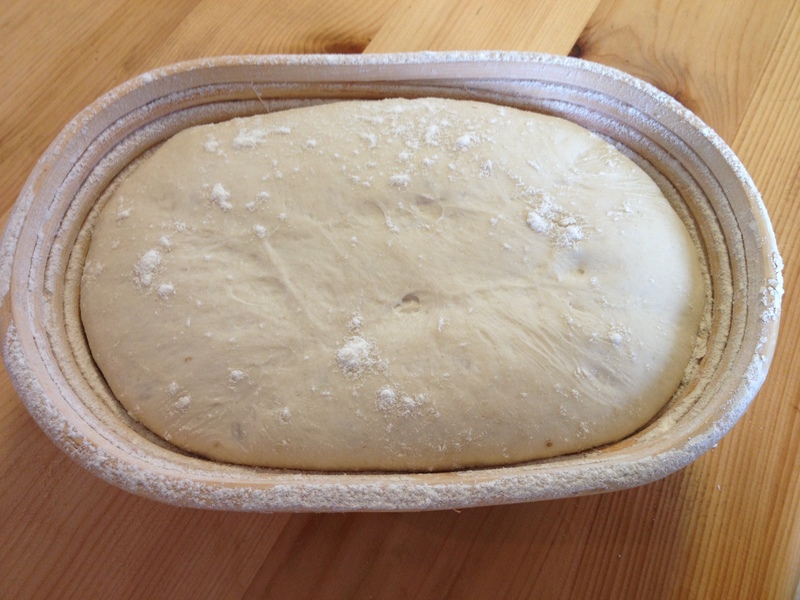 Turn out the dough on to a clean surface and knock back (just kneading again), shape into whatever shape fits your proving bowl (bread tin will work). Flour generously and place each loaf seam side up in a bowl, lined with a couch cloth (a heavily floured tea towel will work fine), this helps you turn out the loaf. Leave prove for a further 2 1/2 hours. 5. Pre-heat the oven to 230C/ Gas7 and place a baking tray with some water or ice cubes in it in the bottom of the oven to steam the oven. Turn the loaf out on to another baking tray. 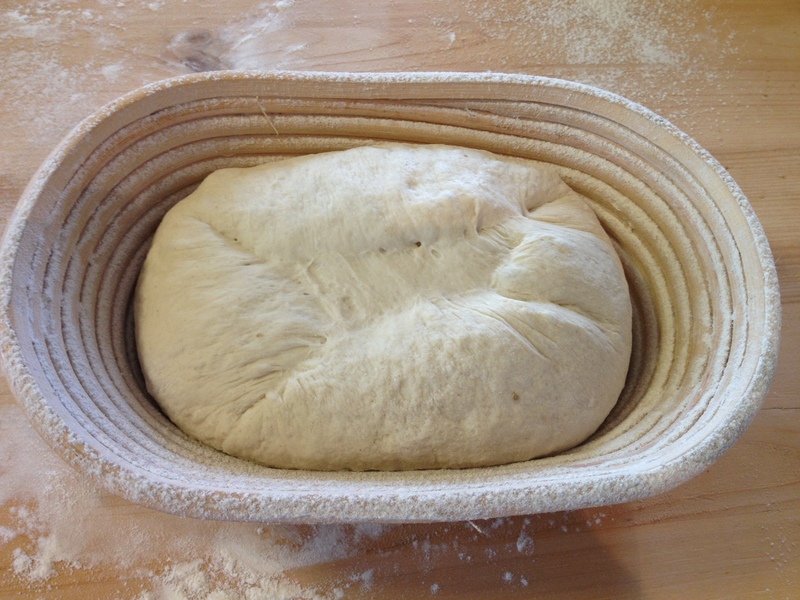 Flour and score the loaf and put in in to the oven. 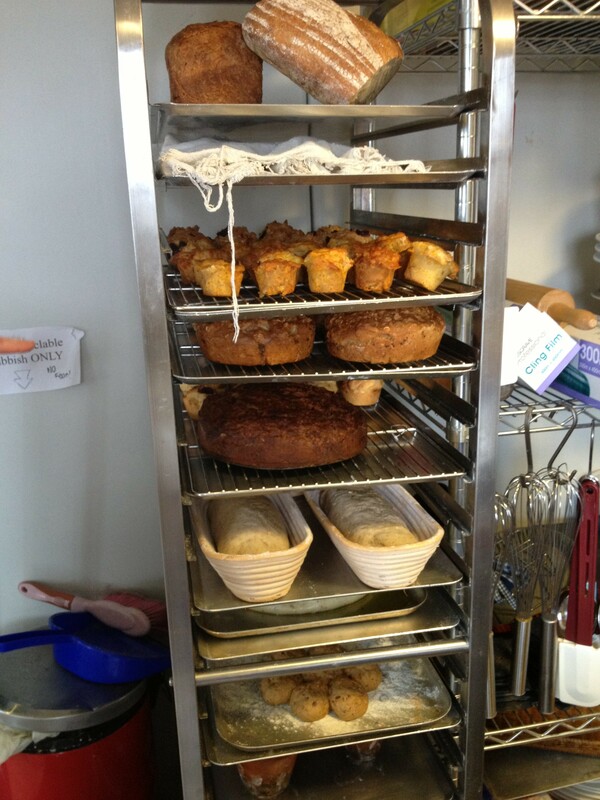 Bake for 35 to 40 minutes or until a good crust has formed and the loaves sounds hollow when tapped on the base. 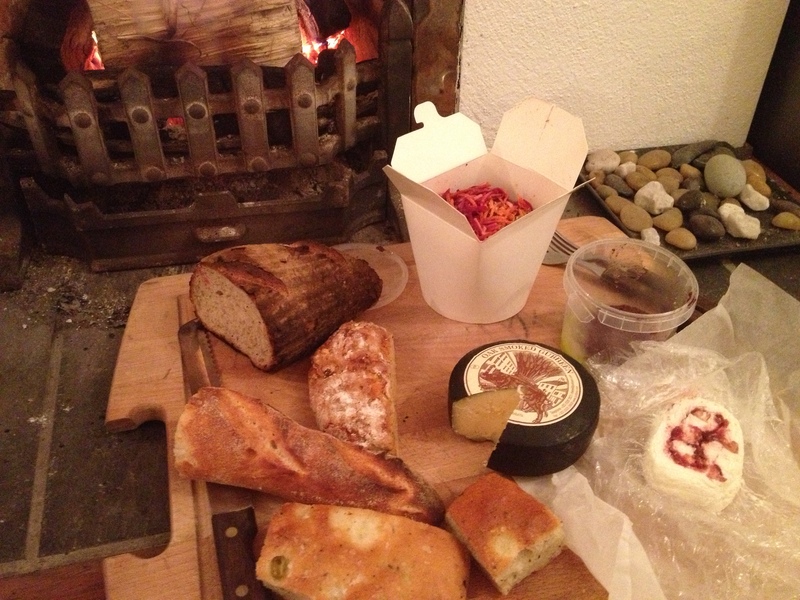 Enjoy your delicious bread with some cheeses, tapenade and salads like we did! In front of the fire with our feet up! Fine looking bread indeed. I love a sourdough. Yes, it was a great course! I have enough bread in the freezer to last me a lifetime!